26.9 million individuals aged ten and over, that is to say 65.4% of the population, use the Internet, and most of them are regular users who connect frequently or very frequently. Following a drop experienced the previous quarter, the total expenditure on ICT services started a slight recovery. 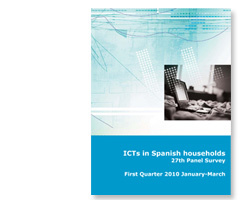 The expenditure on ICT services was €3,345 million in the second quarter of 2010, representing a year-on-year increase of 1.6%, mainly due to the strong boost of the Internet market.